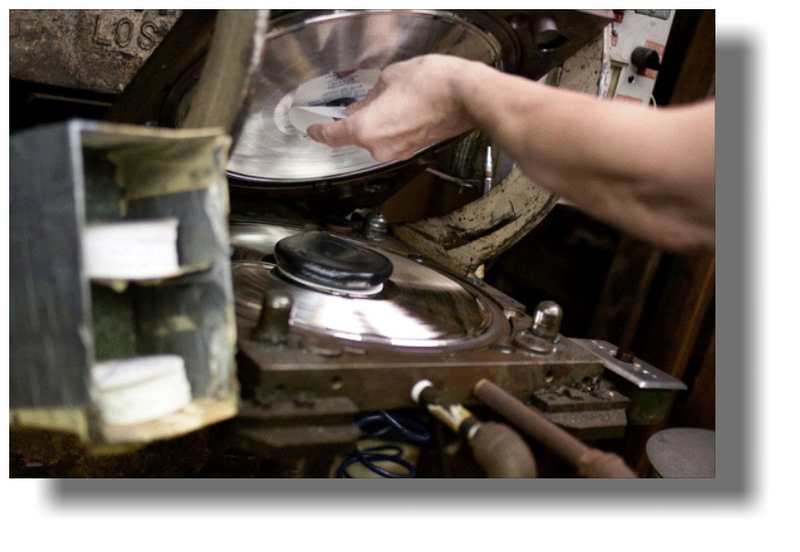 The manufacture of gramophone records commences a process known as cutting the master disc. Technologically, this is a precision maching process in which a modified lathe (left) is used to cut a groove into an aluminium disc coated with nitro-cellulose lacquer by a worm-driven cutter-head and cutter-chisel modulated by a moving-coil assembly similar to that of a conventional loudspeaker. The mineral corundum (Al2O3) is normally used for the cutting chisel in the form of synthetic ruby or sapphire. Blue sapphire is usually considered the best material for the record-cutting as these gems may be manufactured without grains or impurities and can by shaped very precisely; with clean, sharp edges. 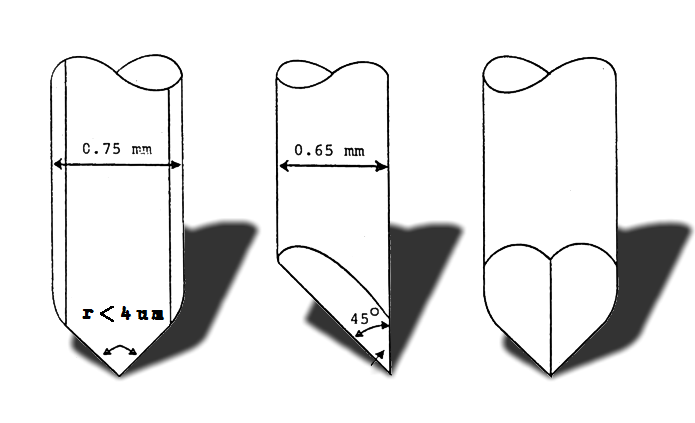 The dimensions of the sapphire stylus in an Ortofon lathe are illustrated. Note the radius of the tip of the stylus (less than 4µm). The accelerations required to drive the cutter-chisel are immense, and the amplifiers for cutting records were the height of audio engineering during the heyday of gramophone records. In processing, the lacquer disc (sometimes called an acetate) is electroplated with nickel. The original lacquer is subsequently removed; yielding a negative nickel impression of the original master disc - in which the groove has become a ridge. This is known as the master. 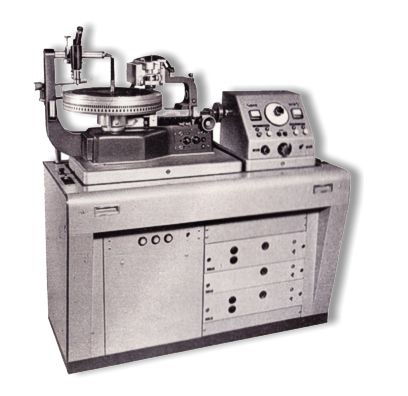 When only a few hundred discs are required, the first nickel master, grown from the lacquer original, may be used as a stamper which is to say, used as a mould for the production records, the ridges in the stamper leaving the impression of grooves in the heated, soft vinyl. If production runs exceed about 1000 discs, a process is undertaken in which an intermediate mother is produced from the master. This metal mother has a groove and may be played just like a normal disc (and, in fact, is played to check it). Multiple, negative discs (stampers) may then be formed from the mother disc. Vinyl records are pressed by placing a hot, soft slab of raw PVC material weighing just a little more than that in the finished record between opposed stampers in a hydraulic press. The PVC plastic material in this form is called a biscuit or a puck. The puck is usually about three inches (75mm) in diameter and about 1 inch (25mm) thick at first. It is introduced into the middle of the press with the record labels above and below it (see photograph). The stampers are then heated with steam to about 140℃ and the jaws of the press close on the biscuit which is squeezed out to flat disc shape in the press under great pressure. During the course of this pressing treatment, the plastic material is forced into conformity with the ridges of the stampers in the press. A visual indication that the plastic has flowed is given by the excess PVC which "splurges" beyond the edges of the press creating a rim of rough, unmoulded plastic known as flashing. After a few seconds, the steam is replaced with cold water. This allows the record to become firm enough to be removed from the press once the jaws of the mould open. The duration of the heating, pressing and cooling cycle is 20 to 30 seconds. The record is then placed on the trimming turntable, where the excess vinyl (flashing - usually about an inch around the edge) is cut away to leave the 12” disc. When squeezing a lump of PVC out to flat, disc form, it must be squeezed everywhere between the faces of the stampers. Unfortunately, it often happens that the outwardly flowing plastic does not completely fill in the leeward side of a ridge. Hence, one or more portions of the outer shoulders of the sound grooves in a finished record are missing and the result, if not spotted and rejected in QC, is a portion of the record in which there is a loud "rasp" on replay. This defect is called no-fill. 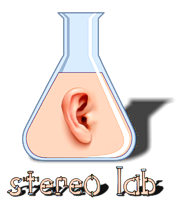 It is very common to hear no-fill on the lead-in of many records and is sadly apparent in many new releases. Pimples are due to impurities in the PVC stock which cause damage in the form of a small dent to the stampers. These dents become small bumps the main playing surface of the moulded record. For some reason, period American discs seem more prone to this than European-manufactured records (perhaps due to the higher proportion of recycled vinyl used, see below). Many times, the small bumps are relatively harmless, but the worst can make the stylus "jump". Of the other issues which beset vinyl, many are caused by the cooling phase. If this is too fast or too slow, the finish of the disc may be affected or it may bend or warp. If the disc is removed from the mould before it is fully hardened, the disc cannot support its own weight and a permanent set takes place in the form of a narrow wrinkle known as pinch-warp. This fault too is unfortunately relatively common in commercial discs. But, by far the most common fault with gramophone records of all eras (including today's audiophile releases) is eccentricity due to the spindle-hole not being in the exact centre of the groove spiral. The RIAA dimensional specification for phonograph records is oddly silent on the tolerance of the position of the centre of the hole from the centre of the Archimedian spiral formed by the recording grooves. There is a requirement for the disc to balance on a diameter of ≤0.437" (111 mm) which thereby specifies the tolerance of the position of centre-hole in terms of its relation to the disc's centre of gravity. But this isn't really the same thing and the requirement is partially self-fulfilled as the record is spun on the trimming turntable about its centre-hole when the flashing is trimmed. An earlier NAB standard1 requires that ..... the disc center hole be concentric with the recorded groove spiral within 0.005 inches (125μm). But is this ± 0.005"? In any case, we have discovered have discovered many examples of the centre-holes of manufactured discs to approach 0.040" (1mm) offset from the true centre. Even in the best case, the centre hole dimensions are 0.286 ± 0.002 inches. And, so as not to foul on the PVC, the normal spindle diameter is 0.275". So it is quite possible to place a "perfect" LP on a perfect deck and still have it sit so that its rotational centre is >0.013" from the true centre of the groove spiral. We can calculate the effect of this degree of eccentricity on the speed variation (wow) of the medium2. Consider the illustration. 0.05 ⁄ 2.5π = 0.0064, or a pk to pk speed variation of 0.64% which is certainly audible, and unpleasantly so! Even in the heyday of vinyl records, when new pressing equipment was available and easy to maintain, the number of rejected discs as a proportion of total manufactured pieces was surprisingly high (and it's even higher today with old, tired presses). Given this rejection ratio, the practice of re-grinding up the rejects to make PVC stock for new discs developed on economic grounds. However, it is usually considered that this recycled PVC produces more surface noise than brand new (or virgin) plastic because it contains fragments of paper from labels and other contaminants. If a very high proportion of recycled PVC was used in the production of a record, it may be detected visually by careful inspection of the run-out groove area. With new PVC, this area is shiny and reflective. If a significant proportion of recycled vinyl is present, this area will have a slightly milky quality due to the thousands of very tiny specks which break up the otherwise high-gloss surface. Contemporary producers of "audiophile" discs eschew re-ground PVC for this reason.